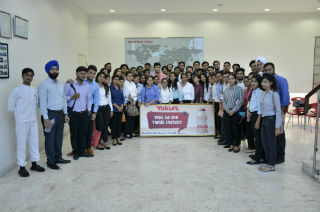 JIMS organized the visit of PGDM students to Yakult Danone, Sonepat plant on 30th August 2016. It was an industrial visit and surely the students learned throughout the tour through guidance and observations. At Yakult, students were warmly welcomed and served Yakult probiotic drink and snacks. After refreshment, Mr Aadish from PR team of the Yakult, briefed them about the company and showed a presentation about the history of probiotics and Yakult like how and when it came into existence, its current status and detailed demographics of the Yakult tree. It was followed by the plant tour where students saw their fully automatic plant that was performing various activities like bottle manufacturing, printing, filling probiotic, sealing and finally packaging in a very perfect and efficient way. The amazing part was that everything was being done so aptly and quickly by machines. 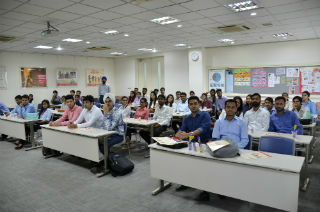 Students asked many rational questions on selling and marketing strategies and operations and production of Yakult. These queries were patiently answered. The trip was a short, crisp and valuable industrial exposure for students covering all the essentials of an industrial visit. Mr N P Singh faculty accompanied the students and Mr. Aadish from Yakult patiently guided them throughout the tour and answered all the queries with extreme calmness.